WakaWaka and Habitat for Humanity have joined forces in the refugee camps in Lebanon and distributed more than 1000 WakaWaka Lights and 1000 WakaWaka Powers + in Bekaa and southern Lebanon. By using the WakaWaka’s, refugees can continue their daily activities even after sunset. For example, children can study at night or do their homework, adults can continue their economic activities, even when the sun is already gone and the elderly can be safer in the evenings. What is the situation in Lebanon? 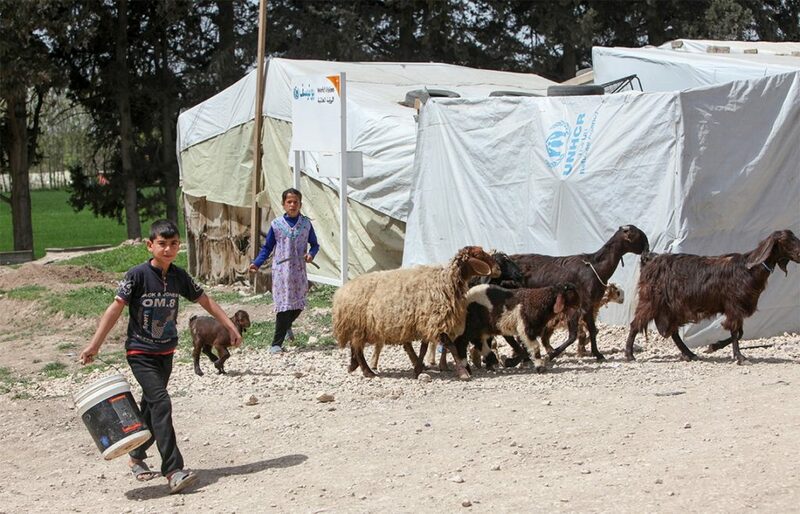 For years Lebanon has found itself caught up in violence and displacement. Political unrest and (civil) wars in its neighbouring countries as well as within its own borders have left its impact on the Lebanese people. The country is currently hosting more than 1 million Syrian refugees and over 400,000 long term refugees from Palestine. These 1.4 million refugees are living among its national population of 4 million. As one can imagine, this is undoubtedly an incredible burden for a small country and, logically, challenges of housing and providing basic needs for all these incoming refugees arise. In response, WakaWaka, the WakaWaka Foundation and Habitat for Humanity have combined forces and distributed over a 1000 WakaWaka Lights and 1000 WakaWaka Powers+ amongst families within these refugee groups in the areas of Bekaa and the South of Lebanon. The WakaWaka’s allow these families to continue their daily activities within the camps or other places of residence where access to electricity is often unavailable. The WakaWaka’s do not only provide light, they offer safety as well. Let us tell you a bit more about Habitat for Humanity (HFH), which is a global non-profit housing organisation working in approximately 70 different countries around the world. Habitat for Humanity and WakaWaka have been collaborating in various projects to provide vulnerable families and other individuals who lack access to electricity via the grid with safe and sustainable energy in order to support them in improving their living conditions and socioeconomic well-being now and in the future. As is what we are working towards in Lebanon. We have also recently created impact together in Zambia. Would you like to know more? Read the Zambia impact story here. Over 10,000 people benefited from the distribution of WakaWaka’s by HFH Lebanon. In general, the function of a WakaWaka is quite simple: they provide light. Their impact specifically in these Lebanese refugee camps, however, are broader and more complex. Not only do they provide light, they also resolve safety and health hazards that occur when using candles or kerosene lamps. Besides that, students can now study and people can continue their economic activities even after dark. The elderly can also move about more safely at night. Families, who received the WakaWaka Powers, can not only use it as a light but can now also charge their phones and other small electronic devices. In this way they have a continuous power supply no matter what the external circumstances. In this was, there is also no need for illegal electricity taps or improvised generators often resulting in electrocutions or damage. In other words, the WakaWaka’s make the refugees’ tents and camps a safer place within the overcrowded urban areas of Lebanon: they will fulfil the need for bright, safe light. This cooperation between WakaWaka and HFH Lebanon is a perfect example that through working together, we can give power to the people, and not merely in a literal sense! Thank you for reading this Impact story until the end. If you haven’t already, you can also contribute to WakaWaka’s impact goal of reaching 5 million people in 2020 who are still living without reliable access to energy. By purchasing one of our products you contribute directly to this goal. Visit our online shop here.